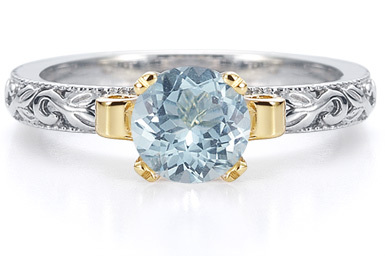 Apples of Gold gives you an aquamarine ring that's more clear than tropical waters. The 6mm aquamarine gemstone set in this art deco style ring will shimmer more beautifully than when the sun hits the water. The stone is set in a lovely yellow gold that brings substance and contrast to the ring. The white gold band makes the perfect base for the ring with elaborate art deco carving and two edges set with small, beaded lines to complete the look. We guarantee our 1 Carat Art Deco Aquamarine Engagement Ring to be high quality, authentic jewelry, as described above.